$2,858.00 of student loan debt accrues every second in the United States and 11% of student loan borrowers are behind on their monthly payments. Today, we may not have an immediate “cure” for this national epidemic, but what we are giving you–is the next closest thing to a cure! Here we go … a 3-step process … Firstly, you need to consolidate your federal student loans into a single loan. Secondly, you need to get on an income-driven repayment plan that offers you the lowest possible monthly payment. Thirdly, you need to make a certain number of qualified payments before becoming eligible for Student Loan Forgiveness … and that includes making a $0 payment for some students. Let’s dive right in and learn how to complete each of these steps with ease. First; go to StudentLoans.Gov and consolidate all of your federal student loans. Once you start your consolidation at StudentLoans.Gov, the entire process only takes about 25 minutes. You want to get approved for an income-driven repayment plan that offers you the lowest monthly payment. A low monthly payment helps you to maximize your loan forgiveness. 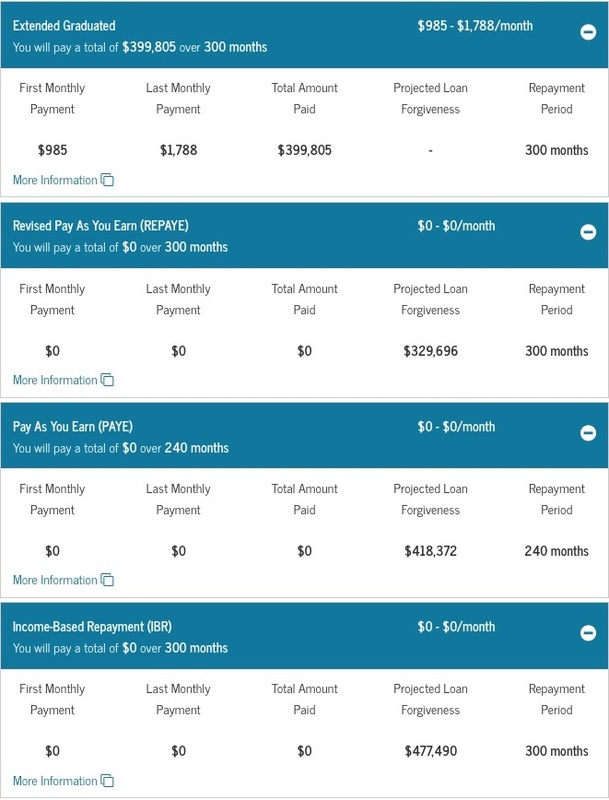 In the image below, you can see the plans that offer the most loan forgiveness are the Pay As You Earn and the Income-Based Repayment. Each of these repayment plans offers a small monthly payment of $65.92 for only 240 payments — giving the student over $155,000 in projected loan forgiveness. On the Income-Based Repayment (IBR) Plan and the Pay As You Earn Repayment (PAYE) Plan your monthly payment can be as low as “zero dollars per month”. “Family size” is referring to the number of people that live in your household where you pay at least 50% of their expenses — and this includes an unborn child. So a female could be pregnant, and that would legally count as an extra family member. Your family size and annual gross income are the two main factors that determine what your monthly payment will be on an income-driven repayment plan after consolidating. The more dependents and children that you support, would equate to a smaller monthly payment. And the lower your annual income is, the smaller your new monthly payment will be. If you’re “past due” on monthly payments, make sure to request 90-days forbearance before consolidating. This will give you enough time to consolidate and prevent your wages from getting garnished. When requesting the forbearance let them know the reason is due to “financial difficulty” — and make sure to only ask for 90-days worth of forbearance. Remember; interest still accumulates when on forbearance. Not that interest is really even relevant to the equation, or is it? I mean who cares about the interest if you can get more than half your balance forgiven right? Hypothetically speaking, all of that interest will end up getting wiped away clean in the end. Well, the problem would only arise if your income drastically improved over the next 240 payments. If that were to happen, your student loan monthly payment would go up, and you could be feeling the pain of the extra interest perhaps then. While consolidating at StudentLoans.Gov, you will be prompted to transfer your tax return from the IRS website. To verify your income, you can click on the “transfer tax return IRS tool” that will be presented to you. However, if you recently lost your income and your tax return shows a higher income than your current income, you would want to select the option where you will manually send your new loan servicer your last month’s worth of pay-stubs. That way you can show the lowest income amount and end up getting the lowest monthly payment. Select the Income-Driven Repayment Plan That Offers the Most Loan Forgiveness. If you work in a public service job, such as teachers’ do, your student loan balance could be forgiven after only 10-years of making qualified payments. The most prominent mistake that I see students’ make is that they forget to recertify at the end of the year, and then get kicked out of their current repayment plan — their payment then shoots back up to what it was before consolidating, and they’re no longer on the path to getting loan forgiveness. Eventually, your wages will get garnished if you fall behind on your student loan payments and don’t do anything about it — because with federal student loans, they can legally garnish your wages without having first to take you to court. So again, just make sure to recertify every year and continue making your monthly payments and staying in good standing. That includes if you are on the zero dollar payment plan, you still have to recertify and submit your income proof every year to make sure you remain on that plan. Recertifying is just updating your loan servicer each year with your current income and family size. If everything stayed the same, your payment would remain the same every year until you’re eventually eligible for loan forgiveness. However, you must recertify at StudentLoans.Gov, every single year. You cannot just upload your income proof to your current loan servicers’ website. 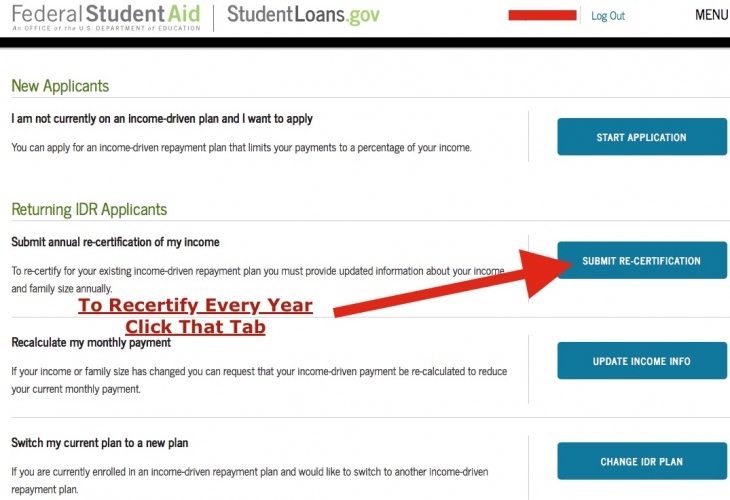 Go to StudentLoans.Gov and click “recertify” (as shown in the image below). 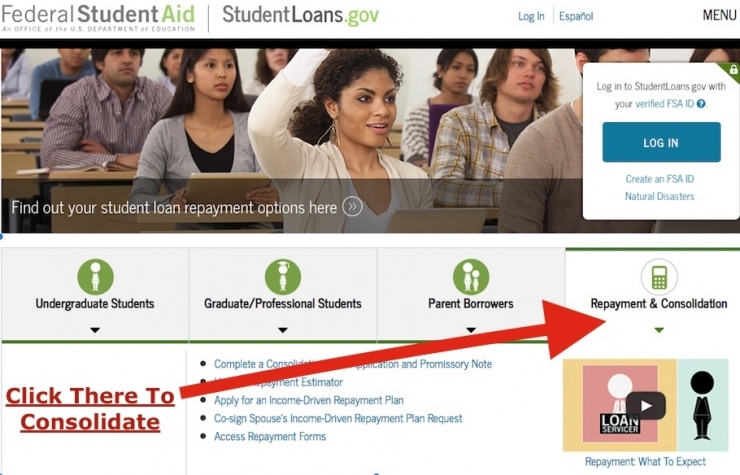 Go to StudentLoans.Gov every year when it’s time to recertify, but instead of clicking on “consolidate your loans” you would select the option to “recertify” where you will then be prompted to verify your current income and family size — just like when you consolidated initially. Again, these are all straightforward steps but necessary steps to complete the student loan forgiveness puzzle. Make sure to give your student loan servicer your cell-phone number so that they can text you when actions are required — and that can be like your calendar alert to remind you to stay on top of your student loan payments. The only extra step you need to take to get approved for Public Service Loan Forgiveness is to make sure after consolidating to have your employer complete their portion of the Employment Certification Public Service Form. Thousands of students are going to be in for a rude awakening when they apply for loan forgiveness after 10-years and get rejected because they never completed this employment certification form to prove that they’ve been working for a public service job over the last 10-years. The Public Service Employment Certification Form needs to be filled out right after consolidating so that your first payment made on your new repayment plan counts towards your loan forgiveness, and you can be eligible for student loan forgiveness on that same day that you hit the 10-year mark! The entire student loan relief process is like a small puzzle; once you know how to put it together, it’s easy! But if a piece of the puzzle is missing, the puzzle will never get completed. Just like with student loan forgiveness, if you don’t finish each step required, you could lose your eligibility for student loan forgiveness.